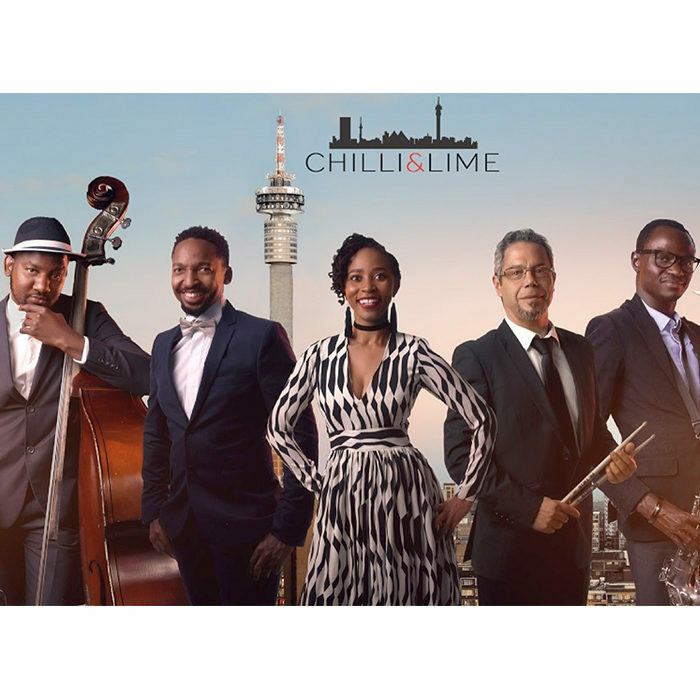 Hailed as The Jazz Maestros, Chili & Lime is a vibrant young jazz band that has firmly established itself on the South African jazz scene and has become one of the most popular jazz bands in the country. Since their inception in 2006, Chilli & Lime has performed alongside great South African artists, including Mango Groove and Judith Sephuma. The lineup includes Johannesburg’s finest talent performing traditional jazz and African favorites. These musicians in their individual capacities have also performed worldwide with well-known artists such as Sibongile Khumalo, Themba Mkize, and Lauren Hill. They have represented South Africa on a number of cultural awards and have performed at Jazz Festivals including New Orleans, USA in 2005, Standard Bank Joy of Jazz, Cape Town International Jazz Festival and The Cape Town Jazzathon. They have also collaborated with South Africa’s most respected artists - Hugh Masekhela, Themba Mkhize, Sibongile Khumalo, Zimology, Khunle, Lesego, Vusi Khumalo and Judith Sephuma, to name a few. Chilli & Lime has performed for President Jacob Zuma, Mrs Winnie Mandela, African ministers of Education and the South African government on numerous occasions. Highlights also include performing for the Vodacom End of Year function at the Coca Cola Dome in front of 6000 people, an international performance in Gaborone, African Polo Cup, BMW X5 launch, J&B Met, SAB Kickstarter Awards, Proudly South African Homegrown Awards, the Business Day Entertainment Awards, the Premier's Service Excellence Awards, Deloitte & Touche Awards hosted at the Fan Court in George, Oliver Empowerment Awards, performances for Department of Defense, G4S, Bidvest, Investec, Etihad Airways, Kumba Laurel Awards, Transnet, as well as performing at year end functions for MTN, BMW, FNB, Sanlam, Eskom, Audi and Mercedes Benz, to name a few.